Enormous crowds and public drunkenness created what police described as “pure chaos” at the annual Holmenkollen Ski Festival in Oslo on Saturday. Intoxicated and aggressive members of the public started fights, tore down security fences and overwhelmed the public transport system, and at least eight people were injured. When an estimated 100,000 people wanted to head home at the end of a long and cold day, the metro system (T-bane) was simply unable to accommodate them. Frustrated passengers, many of them intoxicated, resorted to walking on the electrified tracks, some after falling onto them. 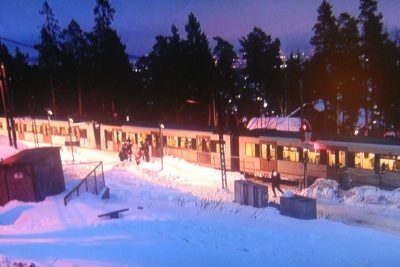 Seven people were injured at the Voksenlia station and another at Besserud. The entire T-bane line was thus halted, compounding the problems of trying to transport people back to town. One woman told NRK she stood in a line at the Frognerseteren station for more than two hours without moving, and that several people fainted around her. There were reports of panic and anxiety attacks among the public, along with unruly behaviour that included assaults on several police officers. They were reinforced by security guards and military police, but NRK reported it took a long time before the situation was brought under control. Residents of the affluent neighbourhood surrounding Holmenkollen reported that many people heading for the ski festival were already drunk while trudging up the hill, with many men using their property as outdoor toilets. When departing, one man was even spotted jumping onto the back of a moving train. Even the athletes may have been affected by the outdoor drinking. Johannes Klæbo, Norway’s new wonderboy of skiing who won two gold medals at the recent Olympics, told NRK that he thinks he ran over a beer bottle cap that caused him to fall during the men’s 50-kilometer race, since “there’s a big gash in my ski.” He ended up in 40th place in the race that was narrowly won by Dario Cologna of Switzerland, literally a hair ahead of Norway’s Martin Johnsrud Sundby with both clocking the same time of two hours, one minute and 48.1 seconds. Maxim Vylegzjanin of Russia placed third. Norway’s ski jumpers, meanwhile, won gold in the World Cup team competition on Saturday. Lene Kristine Dåstol, caught in one of the huge, long lines at a metro stop, wondered how officials ever could think of hosting an Olympics at Holmenkollen, when such chaos reigned at a World Cup ski festival. More events were planned for Sunday, with traditional ski jumping and the women’s 30-kilometer ski race.